National Grid offers a $50 rebate to customers who recycle their spare refrigerator or freezer. Clean, empty equipment can be picked up free of charge for proper recycling, thus keeping the bulky items out of the City’s landfills. For more information or to schedule a pickup, visit their website or call (877) 691-0021. The City of Albany's Department of General Services (DGS) offers curbside recycling for Albany residents living in single family homes or apartment buildings with 4 or fewer units. A wide range of items are accepted (Adobe .pdf), including paper, #1-#7 plastics, glass, cardboard, and cans. Albany recently moved to a single stream recycling process, so you no longer need to separate recyclables into blue or green bins – either works just fine. 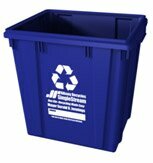 Bins are provided free of charge at DGS’ offices off Erie Boulevard. Commercial entities are required to provide recycling through a private hauler. Contact DGS at (518) 434-2489 for more information. As much as one third of waste sent to the landfill is organic waste that decomposes into methane (a greenhouse gas 20 times more potent than carbon dioxide). Grass clippings, weeds, and a variety of green kitchen waste (vegetables, egg shells and coffee grounds) can be composted in small-scale compost heaps. After the natural cycle of decomposition, the waste is turned into rich, fertile soil that can be used in flower gardens or growing your own produce. Larger material, such as tree branches, is available for curbside pick-up to be used as mulch in the city’s parks. The Capital Region Recycling Partnership has a useful guide on backyard composting (Adobe PDF) for beginners and seasoned veterans.